Asparagus, cooked on the barbecue grill, a simple, delicious summer recipe. General consensus is that one should not grill white asparagus. I agree - green is better, but white will taste delicious as well. It just gets a bit more 'golden' before it's done. Finish with some fresh herbs. 1 tbs freshly snipped chives. Prepare asparagus by snapping off the tough ends. 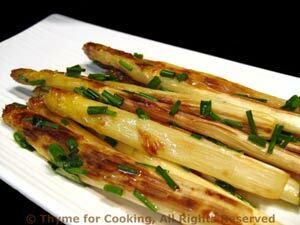 If it's white asparagus use a vegetable peeler and peel stalk end half way to tip. Either cook directly on barbecue grill (being careful not to let any slip through, or on a mesh grill pan. Turn frequently. Should be done in 7 - 15 minutes depending on size and heat. They will start to brown slightly but stay a lovely bright color. Can also be baked at 400F (200C) for 15 - 25 minutes. When done toss with butter and sprinkle with chives. Either serve immediately or keep warm in low (150F, 65C) oven for up to 15 minutes.